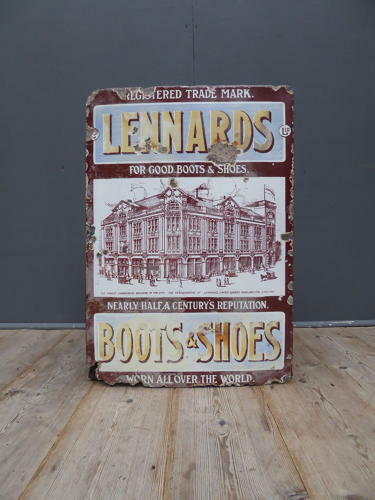 A very rare surviving example of an antique enamel advertising sign for Lennards Boots & Shoes. A wonderful early enamel sign featuring a beautifully detailed pictorial of the Lennards commercial building in Queens Road, Bristol, surrounded by people & local traffic made up mainly of horses & carts! A beautiful sign & a wonderful piece of history. Wear commensurate with age, fading to upper & lower lettered areas, pictorial glosy & very good, minor loss to lower left & right edge. Unrestored.